With the sad passing of one of football’s greatest yesterday, I decided to visit footballia and analyse his European Cup win with a great Barcelona side featuring numerous stars such as Guardiola, Laudrup and Koeman – all of whom would progress onto a coaching career. Their opposition was a talented Sampdoria side who, despite struggling domestically, found themselves in the final and challenged Cruyff’s side well with a squad containing Roberto Mancini and Gianluca Vialli. In typical Cruyff fashion, Barcelona’s shape in possession carried great fluidity with strong collective spacing paired with well-coordinated movements. Working in a loosely-fitting 3-1-2-1-3 formation which showed many permutations through the game as non-standard movements could be seen from the likes of Juan Carlos whilst Laudrup who acted in many ways as a false 9. The Danish genius could be frequently seen in the left half-space as he moved towards his midfield teammates in possession, causing confusion against the man-oriented Sampdoria. 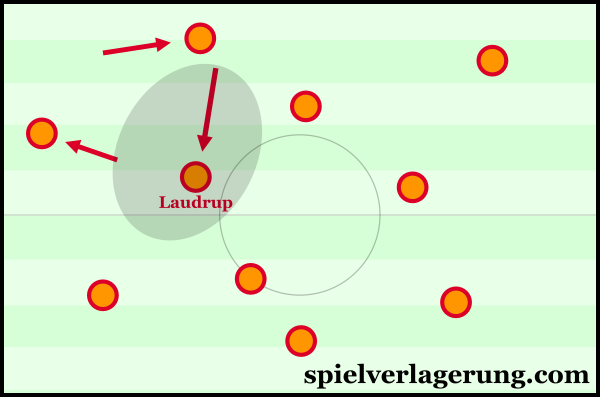 On the right wing, Salinas played particularly close to the right touchline and occasionally made inside movements diagonally when the situation required. Nearby, Bakero moved away from his 10 space and commonly drifted forwards and towards the right half-space. Deeper in midfield, Juan Carlos consistently moved towards the left touchline whereas Eusebio acted as more of a standard 8 on the right. With these differing orientations came an interesting asymmetry through the shape, which could see Juan Carlos as a left midfielder whilst Laudrup filled his space and Stoichkov could move inside towards the ST position. Opening space for Laudrup through Juan Carlos’ wing-oriented movements. Either Stoichkov or Bakero occupied the ST position. Said asymmetry in the structure worked well and further enhanced Barcelona’s ability to open up and manipulate space – something which they were obviously excellent at to begin with. The shape provided a good foundation for fluidity with the potential for various positional rotations in most areas. In doing so they were able to destabilise Sampdoria’s defence and work against the man-oriented nature of their defensive scheme. It became more difficult for Sampdoria to co-ordinate the defence and maintain balance as the dynamic shape was challenging to fully cover with spaces being opened and occupied constantly. 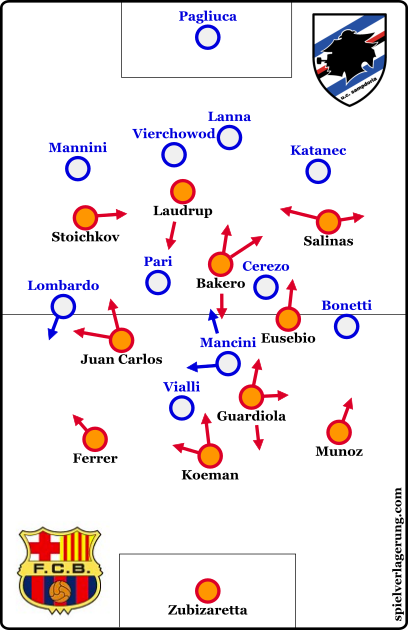 Albeit on a less consistent and individual level as opposed to a collective one, the man-oriented nature of Sampdoria’s defence was ill-equipped to contain such a unique opposition. Not only were they dragged out of position by the movements and rotations within the Barcelona shape, but their ability to manipulate space was often uncontested as the individual defenders were more concerned about their man than the space they covered. The build-up of Barcelona was made largely through the intelligence of their two central players, Pep Guardiola and Ronald Koeman. Guardiola acted as the lone 6 and played just ahead of the defensive line whilst Koeman was the central of defence and showed great ball-playing ability in a libero role. The Dutch defender commonly moved higher against the passive Italian defence and was given some degree of freedom in the initial stages of possession. He exploited this well by demonstrating an excellent capacity to accurately hit long-rang passes, allowing Barcelona access to far-spread spaces on the pitch from such an early time in possession. The long balls were not only accurate but effective in progressing the ball too, as the speed of the pass as well as the flatter trajectory made it easier to be controlled upon it reaching its destination. When he did move out, Guardiola offered well to balance the movement and provide cover when necessary. Although Pep didn’t make as many of these long-range passes he was still as, if not more, important as Koeman (after all, distance of pass doesn’t correlate with how ‘good’ it is). His genius in the Barcelona possession game was clear to see as he helped create strong structures in build-up to create connections and support the ball’s movement forward. The retention ability of the Catalan midfielder was also evident as he was often elusive against the Italian’s press. Just 21-years-old at the time, he showed great composure and maintained his clean short passing under pressure whilst the positional support of a strong collective structure was an important aid too. To have two players in the first and 2nd lines of the shape with such playmaking qualities was a luxury which was crucial to Barcelona’s possession game. Especially when Vialli lead the line on his own, Sampdoria failed to maintain access against them both which was largely down to their passivity in Barcelona’s build-up phase and Koeman in particular actively tried to take advantage with his long passes. After a lack of success in his first few seasons at Barcelona, Cruyff sought to strengthen the team and a means of doing this was in the transfer market. He added exceptionally talented players such as Ronald Koeman, Hristo Stoichkov and Michael Laudrup. The latter became an important player for the team and featured in many roles as his individual excellent gave him the capacity to contribute from many areas. In his start in Catalonia, he most often played behind the striker, either as a 10 in the centre or on the left wing however he gradually moved towards a ‘false 9’ position at the top of the shape. This was the role he took on for the European Cup final as in the press he was in the first line whilst in possession of the ball he dropped frequently towards the midfield. Firstly, it was clear to see a high level of team-tactical intelligence and, more specifically, his perception of team structures as he provided key support in creating connections through the midfield. He always knew how to position himself to have access to the ball as well as how to best utilise the space given and harm the opposition as his understanding of the dynamics was obvious. Secondly, his ability to progress the ball quickly with fast rhythm changes and dribbling was an important tool in Barcelona’s build-up. In many instances during the game he picked the ball up in space and immediately turned forwards to dribble through multiple defenders. The result was a big problem for Sampdoria whose lines of pressure were broken through on a number of cases by the individual genius. Because of the massive ability of the Danish forward, Barcelona often seemed to look directly towards him in order to progress the ball. In a couple of moments in the game, the ball circulation became oriented directly towards the left half-space whilst Juan Carlos stretched towards the left touchline. Laudrup was given space to drop into and from this he could receive the ball well and go on to move the ball forward whether it be through his aforementioned dribbling or in co-ordination with teammates through combinations. For further reading on this excellent player, I recommend MR’s player analyse on the German domain, and click here if you can’t read German. Much like his sides as a player, Cruyff’s Barcelona team was ahead of its time and played at a level rarely seen even 20 years on. Looking past their evident individual qualities, the side’s synergy was similarly obvious and most clearly shown in their ability to create space which was rarely matched. Both as a player and a coach, Cruyff’s innovative nature helped progress football not only in professionalism and performance but on an aesthetic level too. For a much more comprehensive analysis of Cruyff’s career, RM produced an outstanding analysis on the German site which I cannot recommend highly enough.